Leilani Salang didn’t know exactly what she wanted to do with her life but the Blanchet Catholic School senior and Keizer resident did know she wanted to help people. The United Sates Coast Guard will train her to do that. 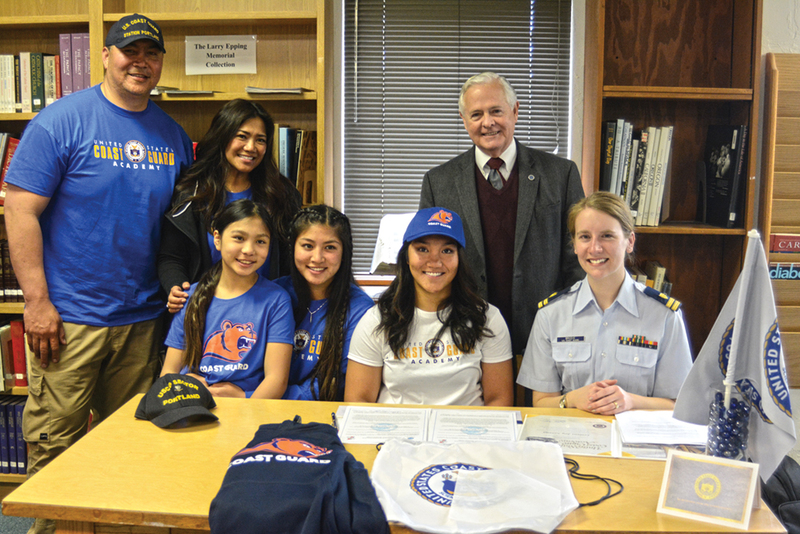 Salang signed her national letter of intent and commitment papers on Wednesday, April 19 in the Blanchet library. Along with being a student, she will compete on the track and field team. For a four-year free education worth $500,000, Salang is committing to five years of service in the Coast Guard after graduation. Coast Guard also runs in Salang’s genes. Her grandfather, who passed away last year, served for more than 25 years and her father eight. While Salang originally wanted to be a physical therapist to help recovering veterans, she’s now turned her attention on being a helicopter pilot and rescuing people out of the ocean. At Blanchet, Salang has impressed on both the track and field. As a junior, she was named the top Girls Field Event Athlete in the PacWest Conference by winning both the discus and shot put while placing second in the javelin. Salang then finished third in the state in discus and fifth in shot put and javelin. In the second meet of her senior season, Salang set a new Blanchet record of 129-05 in the discus. She also has the shot put record of 37-11. Salang runs as well, competing in the 100 and 4×100. The relay team of Salang and three underclassmen won the conference and placed sixth in the state while setting a school record last spring. Salang considered staying in state at Linfield, where she practices hammer every Sunday, or Oregon State, and joining the reserves while in college. However, the chance to continue the Coast Guard tradition was just too big an opportunity to pass up.